Becoming one of the emerging paradigms in the technological world, Managed Cloud hosting is rapidly moving towards being the most sought after innovation. It is an attraction for business owners because it allows them to initiate from a small vision and considerably build along by adding resources only when there is a rise in service demand. It is scalable, hassle-free and helps you plan accordingly. When talking about Cloud Hosting, we need to have an application that we are going to host on the cloud. In this post, I am going to cover the top 3 cloud hosting platforms for WordPress hosting. Let's get started. PHP is engraved into 79.4% of websites on the Web and is one of the most popular web development languages of all time. Facebook, Wikipedia, Yahoo and Photobucket are some of the popular websites which are developed using PHP. WordPress the most popular CMS is also developed in PHP. WordPress powers 16.6% of the Web alone. Other vastly popular content management platforms like Drupal and Joomla are also based on PHP. Now that we have established that PHP is the most popular web development language, let’s talk about PHP compatible web hosting services. So how many web hosting are there particularly for PHP? Hmmm… every single one of them. And this is not a joke. 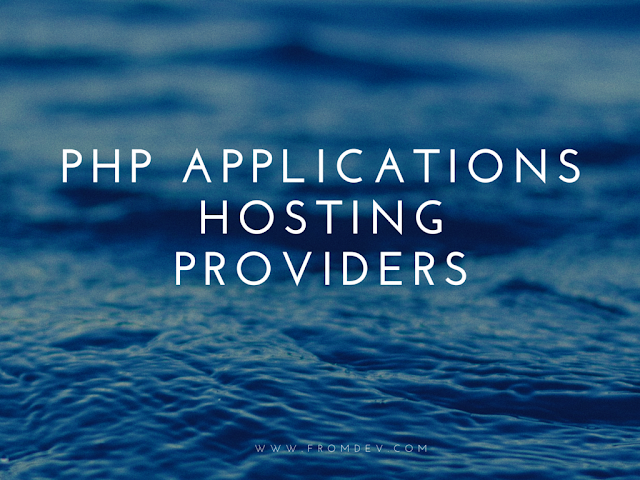 Every web hosting provider supports PHP, and you can literally host your PHP website or web app developed in PHP at any web host you can imagine. While this abundance seems like a good thing but it creates a choice paradox. With literally thousands of options, it rather gets confusing and unproductive to evaluate and test all of them. This article is here to save your time, we have evaluated and curated the 5 best hosting companies for PHP. Today, there are a number of web hosting companies that offer Managed WordPress Hosting services over the internet. This makes it all the most difficult to find the best hosting service provider for your WordPress website. To help you find the best host for your WordPress website, I have compiled together a list of the top 3 Cloud based managed hosting service providers. Fortrabbit is a cloud hosting PaaS (platform as a Service) provider dedicated to PHP applications. It offers versatile deployment options with Git, SSH, SFTP and native Composer integration. It is really a heaven for PHP developers as it is purely developer oriented platform. The only downside of it is that it only provides AWS (Amazon Web Services) infrastructure with only two data centre locations for EU and US. The pricing table for Fortrabbit is pretty good and it runs a pay as you go plan so you only pay for what you use and nothing else. It consist of a monthly billing. It also gives a way to select the individual app components and scale them individually which is a really good factor to attract users. This is the only feature where Fortrabbit falls a bit short. They really don’t have a technical staff for the free users. You have to be self sufficient to use their services as their support staff cannot reply to your technical queries right away. Fortrabbit uses AWS (Amazon Web Services) infrastructure which is one of the most reliable infrastructure out there. So you can really feel comfortable for the uptime of your website. The only reason this gets a 4 out of 5 rating is that it supports only EU-Ireland and US-Virginia server locations to host on. Cloudways is one of the leading Cloud based Hosting Platforms over the internet. It comes with four basic cloud providers (Google, Amazon, DigitalOcean and Vultr) and with many different applications on a single click with a number of configurable options. Being an intuitive cloud-based WordPress hosting platform that serves novices, bloggers, designers, developers and variable agencies, it is one of the most secure platforms to easily manage and deploy Managed Cloud WordPress Hosting. It uses a unique stack of Apache, Nginx, Memcached and Varnish to optimize your website on different cloud servers. One of the best user experience that a person can get. Cloudways console is easy yet powerful. Every application is on a single click installation and you don’t need any backend skills to host a PHP application on Cloudways. Pricing plan for Cloudways, is quite feasible depending on the amount of services that it has to offer to its customers. Although, if you wish to explore you can, but mainly there are six pricing packages at Cloudways and the best thing about Cloudways is that it is a Pay-as-you-Go model which helps you specify the total amount accumulated. Cloudways comes with a free trial period for different cloud providers as well which ranges from 3 days upto 14 days. The support at Cloudways is also pretty good and they have a technical staff seated for this specific job. So if you have any technical issues you can ask directly on the 24x7 chat or open a ticket for it which in my experience is replied pretty quickly as well. Cloudways is as reliable as any other web hosting platform. However the uptime varies according to the infrastructure provider that you use. They provide a variety of infrastructure providers which includes the big fishes like Google Compute Engine and Amazon Web Services and the affordable ones like Vultr and DigitalOcean. Pagoda Box is not a traditional hosting environment. It's structured in a way that allows you to manage and scale your entire application simply and easily. Understanding how best to use the provided tools requires a bit of a paradigm shift in how you manage and scale your application. Pagoda Box servers run on the Solaris-based SmartOS operating system. SmartOS is incredibly powerful OS designed and built for highly-concurrent, virtualized environments. However they do not provide any support for custom compiled executables for SmartOS and Pagodabox only offers a private infrastructure. User friendliness of Pagodabox is improved drastically in pagodabox v2. Very easy to scale your server vertically also features a team member feature. They have managed to bring the v2 a lot better than what it was used to be in v1. However, Pagodabox is still for the coders and a newbie coder still needs help on certain features of the Platform and they still don’t have PHP 7.0 integration available. A bit on the complicated side the pricing plan for Pagodabox is bit confusing. Application, Database and Storage all have a separate pricing so they add-up and they can be separately scaled which is a good thing but for a new user it can be a thing that could leave him scratching his head. Last but not the least the prices are on a bit higher side compared to other in this list. So, this is pretty interesting. They use an IRC channel for a live support in which you won’t get a reply. They do have a ticketing system but I haven’t got enough time to check how frequently they reply to a ticket but judging from their IRC chat it should take at least 15-30 mins. Pagodabox comes with its own OS and infrastructure which at first seems a bit cheesy but it is not. The infrastructure is very well maintained and the SmartOS operating system. The reliability and uptime seems on a better side of the book and you can expect to get a 99.9% uptime on Pagodabox own infrastructure. A2 Hosting a service provider that is biased towards developers. It should not be wrong to say that it is a heaven for developer as it really provides a plethora of dev tools. It is another hosting service that uses a private server rather than integrating it with other infrastructure providers. Another well planned hosting service. The user friendliness and experience of A2 hosting is of top notch. They also uses a cpanel for the interface between the server and the user and integrating different application directly from there on a single click. A2 hosting provides a lot of hosting services, so the pricing plans vary accordingly. Compared to other hosting services like it, A2 has a pretty good pricing plan their lowest managed dedicated server costs 141.09$ and it doesn’t stop there. They have a plan for everyone so don’t worry you can easily get your required server in your budget. So much for the Guru Crew Support. Their support is quick but not very technical for a technical support you should look for their ticketing system. However overall their support was ok. They have a cpanel so you don’t need much support but if you do you can be sure to get a reply if not from chat then open a ticket and your query will be solved. Their reliability and uptime is as good as any other hosting solution like it. They provide a private infrastructure which they boast to have an uptime of 99.9% and that is what we have experienced. Bluehost is a web hosting company owned by Endurance International Group. Bluehost is one of the most popular hosting solutions out there. A hosting solution provider which is in the market for quite a long now. Being one of the oldest it should grow better however the support and uptime of bluehost tells you an entirely different story of their current services. Even though being cheaper they are loosing a lot of customers due to ill managed services. User experience is good and friendly as they use cpanel integration for it and it is good when it comes to use experience. You can easily monitor, scale and add new application on a single click. Pricing is their strongest points as they have one of the lowest rates in the market and it is really hard to compete with their prices. The smallest server that you can get costs only 3.49$ which is pretty low compared to other such plans. Bluehost has really lost their customers on this feature. Their support seems to care about nothing and most important the support staff is not technical. Moreover the wait time is over 30 mins for you to start a chat that is pretty bizarre. Bluehost is big but going big is the easy part retaining your users and giving them the better user experience than before is where the hard part comes in. Bluehost’s server uptime is bad and with bad I mean really bad. What good a server is when your website is having a long downtimes while their support has no answers for it. So to conclude my thoughts I would say it depends on your needs and your pocket. If you need a hosting provider that covers you from all around and gives you the best managed services with awesome prices then go with Cloudways. If you prefer a more dev oriented hosting platform for PHP where pricing is not the issue, then go with A2 Hosting. Ahmed Khan is the PHP Community Manager at Cloudways, a hosting company that specializes in optimized PHP hosting services.. He writes about PHP, MySQL and covers different tips and tricks related to PHP. He is currently active on Cloudways and other different blogs. When he is not writing about PHP, he likes watching The Flash, Game Of Thrones and is a die-hard fan of DC Comics. You can follow him on Twitter or connect with him on Facebook.